3½ miles south east of Coldstream lies the English village of Branxton. Just under 500 years ago, on 9 September 1513, what many believe to have been one of the most important events in Scottish history took place here. Scottish and English armies met in what has since been variously called the Battle of Flodden, the Battle of Flodden Field, or the Battle of Branxton Moor. 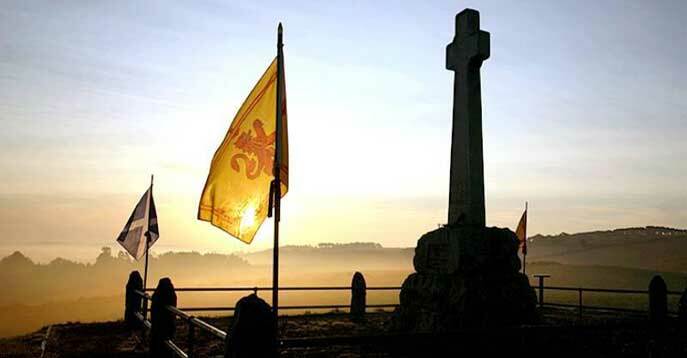 In 1910 the Flodden Monument was erected on a ridge in a field near Branxton. This remembered the fallen, but in practice the monument and the interpretive board added later did little explain what happened that day or why: or even really where. This deficiency was remedied in 2004 with the establishment of the Flodden Battlefield Trail, a 1¾ mile walk along field-edge paths taking in some of the key locations in the battle, complete with a series of excellent interpretive boards explaining their significance. 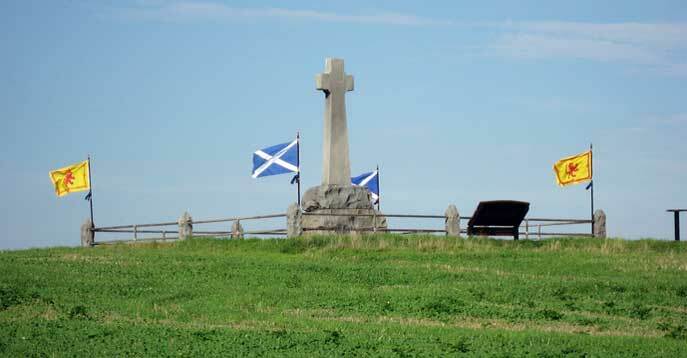 As a result the story of what happened at Flodden is now much more clearly set out for visitors to enjoy and to appreciate for themselves. So what did happen? Well the outcome was a catastrophe for Scotland, and a triumph for England. The Scots lost up to 10,000 dead out of an army of some 25,000. The Scottish dead included King James IV himself, plus an archbishop, two bishops, 11 earls, 15 lords and 300 knights: in effect a whole generation of the Scottish nobility was swept away. The English lost just 1,700 dead out of an army of around 20,000. What made things much worse from a Scottish point of view was that this was a battle that need never have happened. In 1513 Henry VIII invaded France as part of the War of the League of Cambrai or the War of the Holy League, a conflict that focused on Italy, but which involved most of Europe at one time or another. Scotland had a mutual defence treaty with France against England, the Auld Alliance, so James IV felt obliged to become involved. In line with his perception of the rules of chivalry at the time, he notified the English of his intention to invade, and a month later did so, quickly taking Norham Castle amongst a number of other English strongholds in Northumberland. The English raised an army under the Earl of Surrey which, though outnumbered by the Scots, hastened north to give battle. 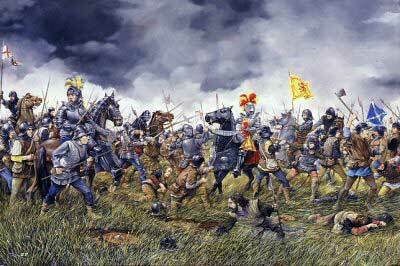 James had positioned his army on the strong defensive line of Flodden Edge. Surrey outflanked him to the east, crossing the River Till to take up positions to his north centred on the village of Branxton, which cut off the Scottish Army's lines of communication back to Scotland. James responded by moving his army a mile north from Flodden Edge to a lower ridge that still overlooked the English positions to their north. valley which is today marked by a hedge and a stream. In 1513 much of the valley floor was marshy. The battle started with an artillery duel. Most of the lighter Scottish artillery was on board the Scottish fleet, which was assisting the French against the English. And the heavy Scottish guns that were present had difficult lowering their firing angles to target the English troops on the lower ridge opposite. Meanwhile the larger number of smaller and more maneuverable English guns had no problem picking off the Scottish guns and then wreaking havoc on the Scottish lines. In response, the left wing of the Scottish army advanced, doing considerable damage to the right wing of the English army. Seeing their success, the rest of the Scottish army surged down into the valley. Here they ran into three problems. The first was that most of the valley was far marshier than the part crossed by the initial Scottish advance, and the Scots rapidly became bogged down, unable to keep their formation or effectively attack the English. The second problem was that most of the Scots were equipped with long pikes. These had proved very effective on the continent, but the Scots had not had time to train properly in their use, and the morass on the valley floor made their users extremely vulnerable to the English infantry equipped with much shorter billhooks. It was here that the Scots suffered most of their casualties. And the third problem suffered by the Scottish centre and right was that their left wing, having won "their" part of the battle, had withdrawn, perhaps assuming that their colleagues would have as little difficulty defeating the English as they had themselves. The battle ground to a halt as light started to fade after 6.00pm, and both sides withdrew in good order. The English commander, the Earl of Surrey, was unsure about the outcome of the battle until the following morning, when the piles of Scottish bodies revealed just how complete his victory had been. Not only had the Scots lost, but they had lost to the an inferior English enemy. James Henderson (or Henrysone), Laird of the barony of Fordell, Fife; Lord Justice Clerk; killed along with his eldest son, see below. (Robert?) Henderson, eldest son of James, above; killed with his father.